When Blaise was a little guy we had too many toys, and they kept coming in. Family, friends, my Amazon addiction, a commemorative toy for every Target trip (which is at least once a week) … way too many toys. So I purged. Now, we have two toy systems: everyday toys and once-in-a-while toys. Around here, less is better. When we had too many toys Blaise would be overwhelmed with what to play with. He’d play a little with one, move to another, then another … baby ADD. 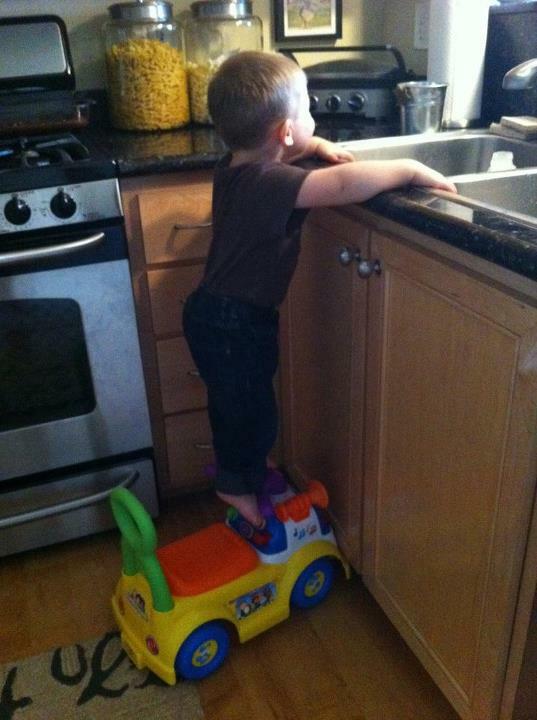 Or he’d play with none but go for Amazon boxes, kitchen utensils, pots/pans, non-toys. 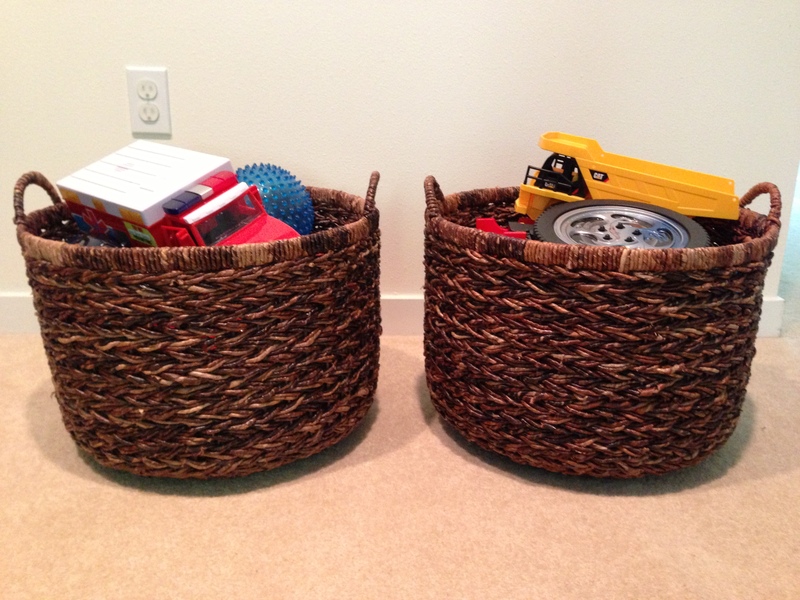 So I bought four baskets; two for downstairs and two for their room. (The two in their room shouldn’t really count since one is stuffed animals that are just rotating sleeping buddies and the other is for everyday downstairs toys that the kiddos bring upstairs.) If the everyday toys don’t fit in them, then we purge some more. With the exception of books, which are always available; the train set which is kept in its own small basket in the family room; and two ride-on toys. Blaise plays with toys the most, Laine prefers to read and harass Blaise. Tonka Ambulance: This has been a favorite for almost a year. Not only is it fun on its own, it’s fun to play with by putting other toys inside (which is primarily how Blaise plays these days). Hot Wheels: The most played with. 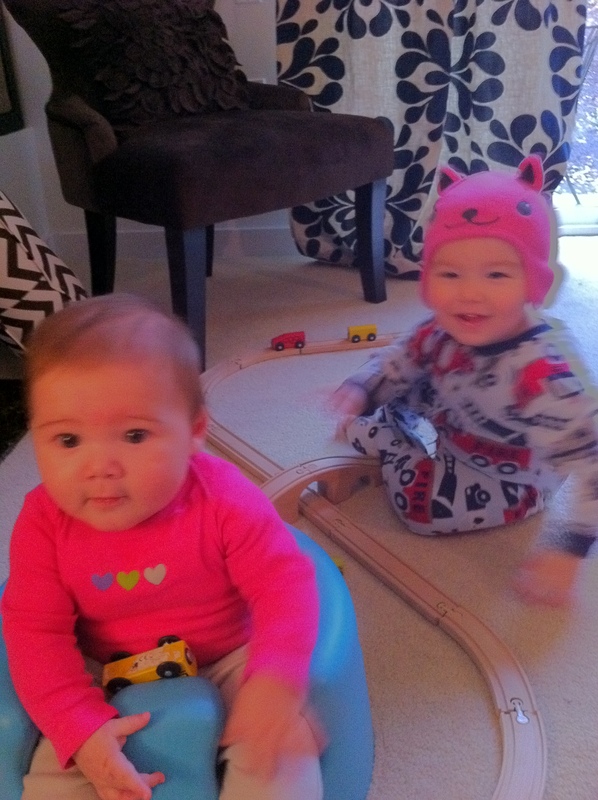 Blaise and Laine love to push the cars around, make them drive on the floor and table while making vroom-vroom sounds. Blaise also uses the Hot Wheels to put in other toys, then take them out (the Tonka Ambulance is one). He also likes to line them up front to back. And if there is one front to front or back to back, he’s on it. 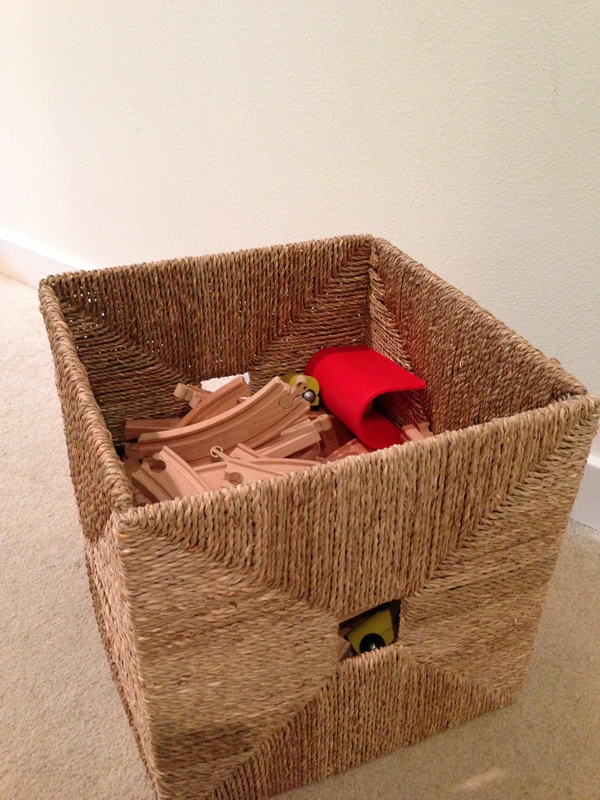 CAT Dump Truck: Blaise was gifted this for his second birthday and it has become an everyday favorite. It’s great for putting things in and it’s motorized so it moves front, back, and dumps with the push of a button. Stack & Roll Cups: Blaise has mostly outgrown his stacking everything phase, Laine is still currently in the phase. These are great because they can be stacked, combined into several balls, or into one ball. They can also put things inside the balls that make different sounds as they roll. 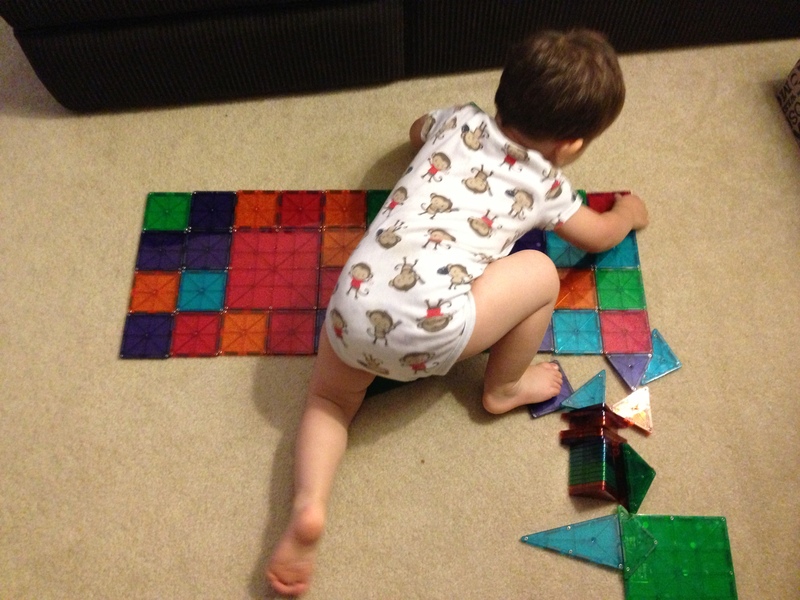 Magna-Tiles: When we were home in July their cousins have these and they were a huge hit, and they are a hit around here too. 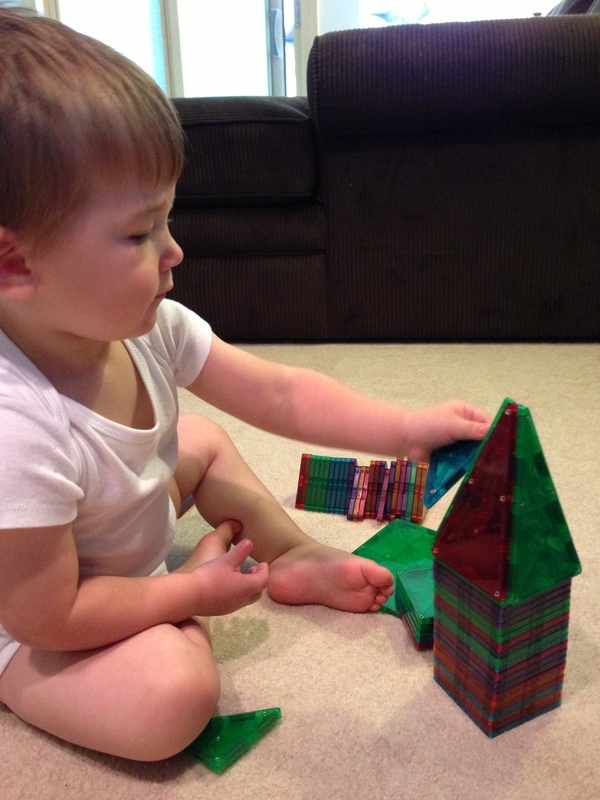 Blaise likes to make structures or line them up on the floor and/or make shapes, Laine likes to break up whatever Blaise is making. 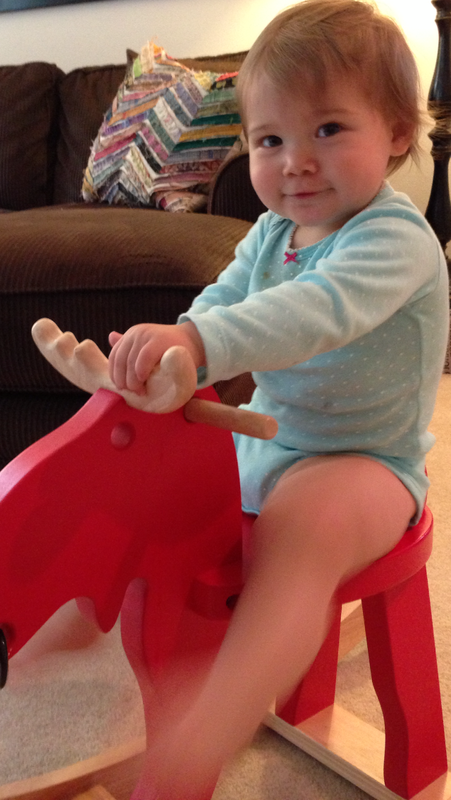 Ride-On Toys: We have an Ikea Moose Rocker and a Fisher-Price Little People Musical Car (being used for evil earlier this year below). Other Everyday Toys: Random vehicles that have been bought or gifted; sunglasses that Laine loves to wear; two creepy dolls that are never touched but we feel like we should have some girly toys; wiffle and rubber balls; Buzz Lightyear and Woody dolls; and a few little action figures. Bath Toys: Technically they are everyday toys but these are for bath time only: Ikea Pots & Pans (the strainer is a huge hit) and Alphabet Letters. And of course, not a toy per se but a bath must, Fizzy Color Tablets. Back when we had too many toys I’d rotate some and found he played with them more when they were “new” again. So when I did the big purge, I bought some bins to store the keepers in the closet. 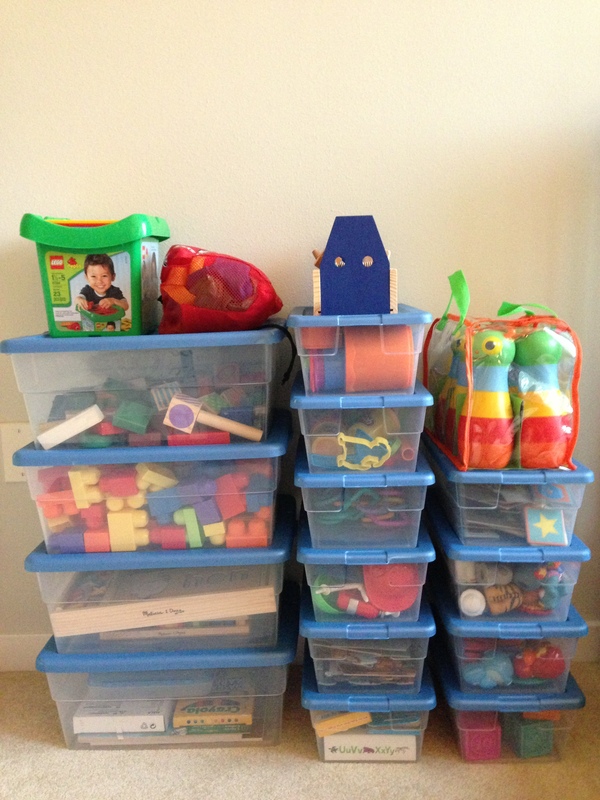 I’ve since added more bins as we obtained more toys, and purged and replaced others. I like variety so I imagine the kiddos do too. 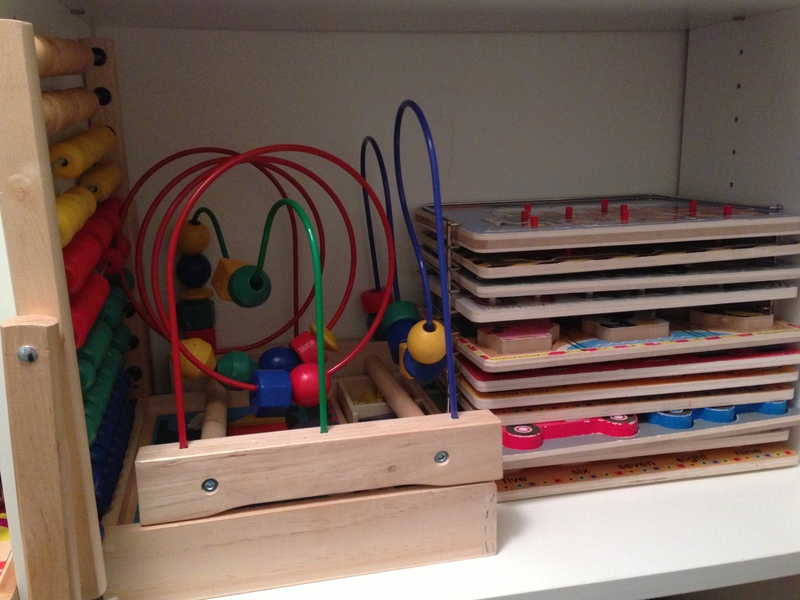 Also stored with the toy bins are more Melissa & Doug/Ikea puzzles that I rotate with the everyday ones.